Plot Summary: There once was a pirate known as the Great Gold Pirate Woonan, who obtained almost 1/3 of the world's gold. Over the course of a few years, the pirate's existence faded, and a legend grew that he disappeared with his gold to a remote island, an island pirates continue to search for. 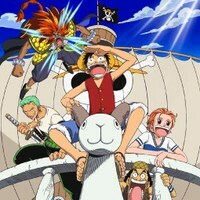 Aboard the Going Merry, Luffy and his crew, starved and reckless, are robbed of their treasure. In an attempt to get it back, they wreck the getaway ship, guided by a young boy named Tabio, who's a captured part of El Drago's pirate crew. El Drago's love for gold has driven him to look for Woonan's island, and thanks to Woonan's treasure map, he finds it. During this time, Luffy's crew have been split up, and despite their own circumstances, they must find a way to stop El Drago from obtaining Woonan's gold.